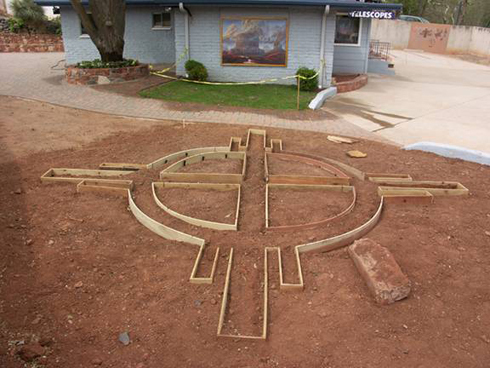 A Starglyph Medicine Wheel symbol is being designed into a garden at Bearcloud’s new Mystic Earth Galleria. This huge symbol will be filled with stone (white crushed marble). Come offer a shovel of stone as a gift that sends your voice. Thank you for your thoughts towards a planet in harmony. Make an offering that carries your wishes and dreams in the Great Mystery. What can you envision that can assist the planet at this time of true need? Help by placing a scoop of stone into the circle of the Starglyph Medicine Wheel in the heart of Sedona, and send your voice into the winds of the Great Mystery. Click HERE to read the article about the Medicine Wheel. Saturday April 16th, we will have a video camera present to capture the thoughts of those of you who wish to contribute. The power of thought and our inner voice touches the stars.